This year I used more of those white bags I have stashed away to house the goodies. 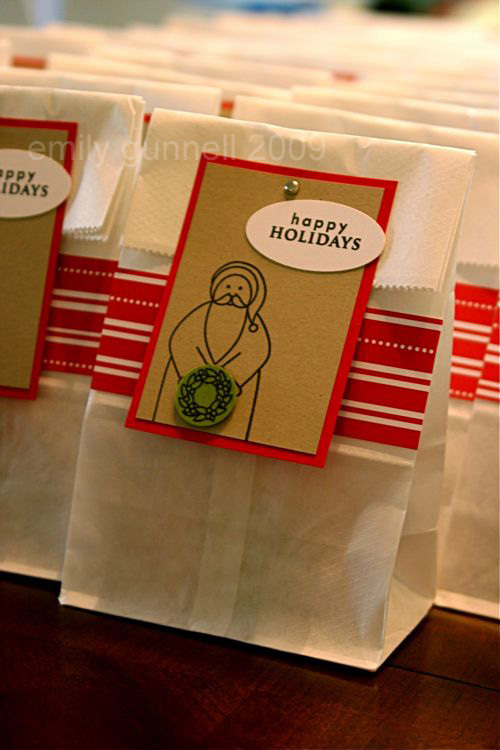 Inside each bag is a pack of hot chocolate, some holiday marshmallows, two chocolate bells (think Hershey kisses), and a soft peppermint stick. The idea is to mix all those into the hot chocolate, but from experience with my own boys, that’s not going to happen. LOL! I used the stamp sets Believe and Faux Ribbon (for the sentiment) from PaperTrey Ink. I really like how these turned out and I love using up stuff from my stash! I just wish picking a family picture to send out was as easy as putting these bags together!